POST FALLS — To see the world through Jessica Workman’s eyes, you’d have to be in a wheelchair navigating broken-up sidewalks, dodging spray from sprinklers and hoping motorists see you on the side road when you’re forced to take a detour. The 22-year-old has been bound to a wheelchair for the past year and a half, erasing activities such as hiking and basketball that she enjoyed before. Workman has dystonia, a disorder characterized by involuntary muscle contractions that cause repetitive or twisting movements. Workman also was a volunteer for those with special needs and at nursing homes, but her mission these days is helping to smooth travels for those with disabilities. 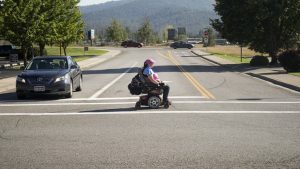 That means she has had to find the best possible routes for her chair from her apartment near Treaty Rock to Super 1 Foods and other businesses since moving to Post Falls from Coeur d’Alene two months ago. Workman said progress on access improvements for those with disabilities has already been made. She called the Disability Action Center to explain she needed to maneuver her wheelchair onto the street to get around a broken sidewalk. The detour caused her to have to enter oncoming traffic. Within two weeks of hearing from Workman and the center, the city had the sidewalk repaired, making it a smooth ride along Idaho Street for Workman and others with disabilities. Workman said she was amazed at the quick response. “They’ve listened to my everyday struggles,” she said. Workman said the city not only fixed the sidewalk, but it is working with her on other projects around town to help make Post Falls more accessible. 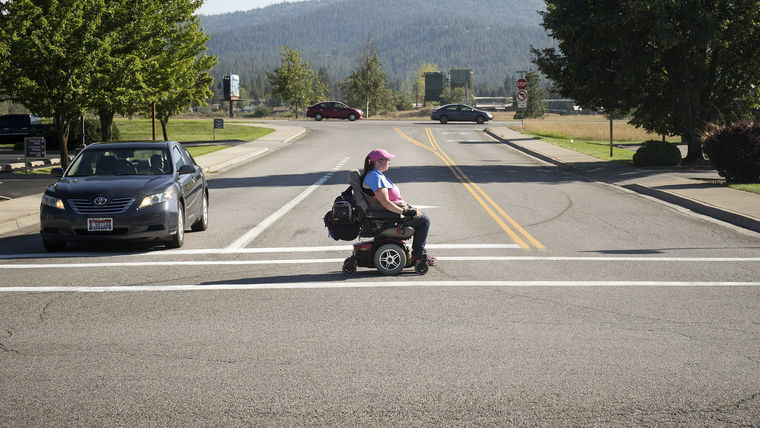 Rob Palus, Post Falls assistant city engineer, said while all new roads and sidewalks must be built to standards under the Americans with Disabilities Act (ADA). New signalized intersections also have beeping sounds to help those with disabilities find the cross buttons. The city has also made an effort over the past decade to make improvements to the older sidewalks and roads, Palus said. Palus said the city sometimes receives concerns about why tax dollars are being spent for bicycle paths and sidewalks when roads for vehicular traffic still need to be improved. But there are also young and elderly residents in similar situations to Workman’s who can’t get where they’re going without having their chairs damaged by sprinkler spray or axles destroyed by uneven sidewalks. “It’s good to know you can help make someone’s life a little better,” Palus said. Michelle Porter of the Disability Action Center said congratulations are in order — for the city for the improvements it is making, and for Workman for advocating for herself and others in similar situations. Brian Walker can be reached at bwalker@cdapress.com. Follow him on Twitter @brianCDAPress.